So we finally found something that our sweet little boy doesn't like: carrots. Don't be fooled by the large quantity surrounding his mouth. That's the only place they ended up. We're going to try again soon, though. 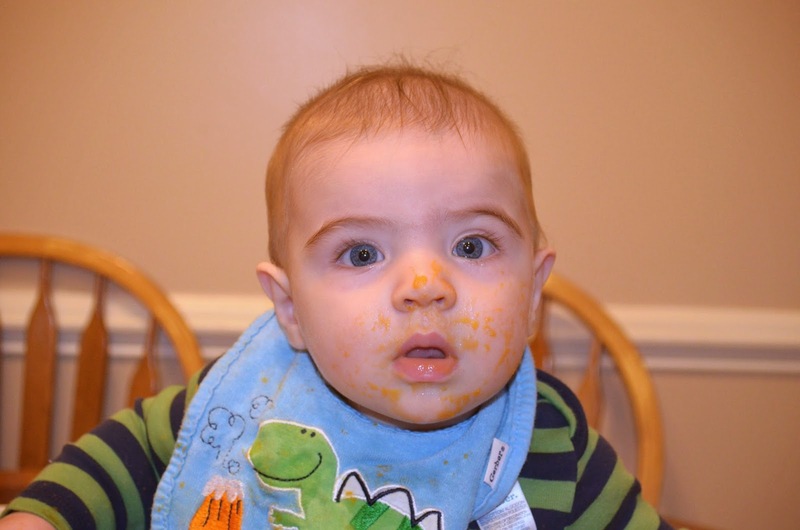 My pediatrician recommends not pushing your baby to eat something if he/she doesn't like it, and to instead try again in a few weeks. I mean, you wouldn't want to be forced to eat something you didn't like, right? They're super easy to make and are packed with vitamins, so I'm hoping he comes around sooner or later! Heat a large pot of water to boiling. Rinse the carrots under cold water. If using whole carrots, remove greens, peel and cut into chunks. Add the carrots to the water and cook for about 10 minutes, or until tender. Drain carrots and add to a food processor. Add 1/4 cup of purified water and process until smooth. Add more water, if necessary, to get to your desired consistency. Allow to cool then serve to your baby with a spoon. 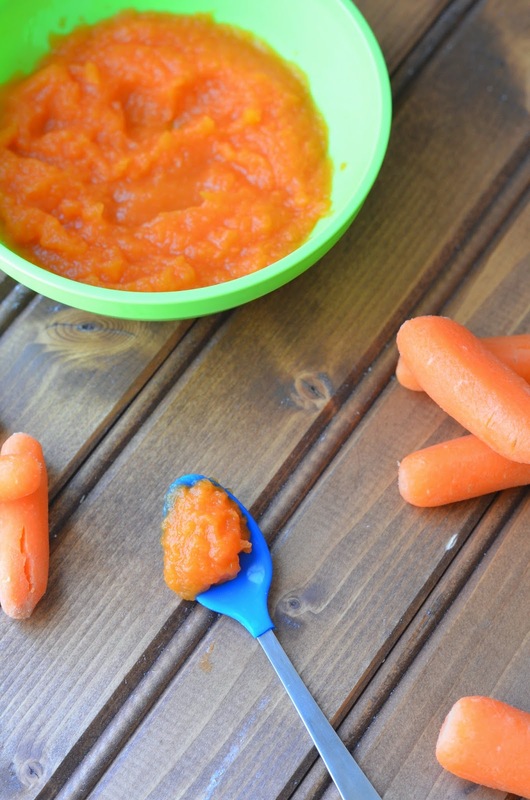 I recommend adding some breast milk or formula to the pureed carrots as well...this thins out the carrots and adds a flavor they already know and enjoy. If saving for a later date, pour it into storage cups to freeze or refrigerate. You can refrigerate up to 3 days or freeze for 30 days. Make sure you label your carrots! Once you are ready to serve, heat the refrigerated or frozen carrots up in the microwave and allow to cool to just warmer than room temperature. Add breast milk or formula to thin it out.